A young woman's coming of age, a romantic love story, and a spiritual journey—each infused with the lessons of history. In the Image is an extraordinary first novel illuminated by spiritual exploration, one that remembers "a language, a literature, a held hand, an entire world lived and breathed in the image of God." Bill Landsmann, an elderly Jewish refugee in a New Jersey suburb with a passion for travel, is obsessed with building his slide collection of images from the Bible that he finds scattered throughout the world. The novel begins when he crosses paths with his granddaughter's friend, Leora, and continues by moving forward through her life and backward through his, revealing the unexpected links between his family's past and her family's future. 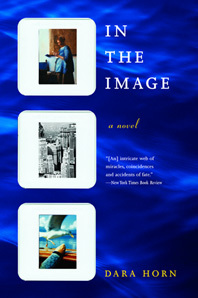 Not just a first novel but a cultural event—a wedding of secular and religious forms of literature—In the Image neither lives in the past nor seeks to escape it, but rather assimilates it, in the best sense of the word, honoring what is lost and finding, among the lost things, the treasures that can renew the present. Reading group guide included. “A gripping story told with learning and passion. It does not just use Jewish sources, it breathes them, and breathes into them the breath of life.” — Rabbi David Wolpe, author of Why Be Jewish?